Turns out it was less the Men In Black neuralyzer and more what Jason Clare described as a bucket of prawns: ok on the first day, but not smelling great after a couple of days in the sunlight. 2. Last week the Government claimed to be delivering education reforms which had been cut under Tony Abbott. 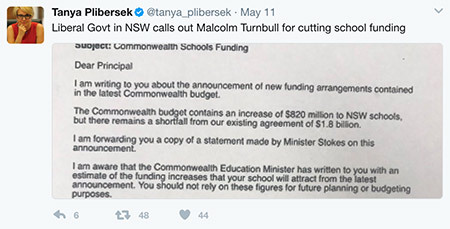 Tanya Plibersek has been pointing out every day that the Government’s new policy involves a $22 billion cut to schools across the country. The Government's argument that it was somehow providing additional funding collapsed on Thursday when Tanya read from an email that had been sent by the head of the NSW Education Department to every public school principal. The email said the Federal Budget leaves a “shortfall from our existing agreement of $1.8 billion” and said “you should not rely on these figures for future planning or budgeting purposes”. The difference between us and the Government was crystal clear last night when Bill committed Labor to restoring the $22 billion and delivering the resources our schools need. 3. It's silly to pretend everything in the Budget was bad. There's one policy in particular we should all welcome. The Government announced it will be implementing a policy Labor has been advocating for years: to stop those charged with family violence from being able to personally cross-examine the victims of family violence. It has been an awful practice which has caused people to have to relive their trauma. 4. Some of the most inspirational work I've seen has been the work of Indigenous Rangers. This program funds Aboriginal and Torres Strait Islander men and women to work as rangers on their own land. They combine the latest environmental science with traditional knowledge to care for country as their ancestors have since the first sunrise. While it didn't receive much publicity, Bill committed in his Budget Reply to a Labor Government doubling the number of Indigenous Rangers. I'm personally really proud of the party for making this commitment. 5. On Wednesday after Question Time we had a debate where Shadow Ministers one after the other explained how the Budget had failed. Chris Bowen led off on the way the Government has no plan at all for the future of the economy, Tanya Plibersek went through the cuts to schools and universities, Jenny Macklin made clear how the cruelty hadn't left the Budget, Anthony Albanese explained that over the next four years federal infrastructure funding will collapse to its lowest level in more than a decade and Catherine King focussed on the cuts to Medicare continuing for years. Government Members spoke in the debate by repeating the word “fairness” as often as possible and hoping that would be enough. 1. Just in case you were wondering why Malcolm Turnbull and Scott Morrison were trying to use the word fairness every 20 seconds here's why: the Budget is unfair. Terribly unfair. Consider this, with electricity prices rising they want to cut the energy supplement for new pensioners, people with disability, carers and Newstart recipients, they still want to shift the pension age to 70, they want to give everyone a tax increase except for the highest income earners who get a tax cut and the handout to big business just got worse. 2. Thursday was one of the most extraordinary Question Times we've had. Well I can only vouch for the first 55 minutes as I was thrown out for an hour before we finished. The first question was the one from Tanya I mentioned earlier. Question 2 was a very simple question from Bill. He asked what was the updated cost of the Government’s company tax cut. First Malcolm Turnbull said $26 billion, then Scott Morrison said $36.5 billion dollars. At this moment Chris Bowen called out “We have to stop asking these questions, it’s going up too quickly, the country can't afford it.” Chris was then thrown out. Next Scott Morrison said it was $35.6 billion and finally they admitted the full cost was now $65 billion dollars. Nick Champion interjected “Put a fork in him, he's cooked.” And yes, Nick was then thrown out. 3. Sometimes silence tells you everything. The Government had a good run in the media for withdrawing some of the measures from the 2014 Budget. They've become known as the “zombie” cuts. They were extraordinarily cruel and involved policies like leaving unemployed Australians with nothing to live on for weeks. Jenny Macklin has led the charge for Labor against these measures and our campaigning has seen the Government fail every time it tried to get them through the Parliament. But when asked whether they still believed in the measures, no Member of the Government would give a direct answer. When the Liberal Minister Christian Porter had to come into the House of Reps on Wednesday morning to take the measures off Parliament’s Notice Paper he not only refused to make a speech, he wouldn't even read the motion out loud. For an hour and a half Labor Members spoke in favour of a Government motion to get rid of these measures and not one Member of the Government stood up to speak in support of their own motion. It was like Jim Carrey in that movie Liar Liar where he tries to say nothing because he's terrified he might say the truth. There's no doubt the Government still supports these measures and will bring them back first chance it gets. Like in the horror movies, the zombies keep coming back. 4. Remember the Liberal Party’s debt truck? Well as Warren Snowdon from the Northern Territory interjected, now it's a road train. Australia is now heading towards nearly three-quarters of a trillion dollars in debt under this Government. Yet they still have $65 billion in spare change to give away to multinational corporations. 5. The debate on Native Title continued in the Senate. While some of the online campaigns have implied this legislation is only about one project, the truth is it affects over 120 Indigenous Land Use Agreements. Labor continues to refuse to let the Government rush this through. Have a listen to a great speech from Malarndirri McCarthy explaining why we won't be rushed. Senator Malarndirri McCarthy was awarded an honorary doctorate at the National Indigenous Human Rights Awards at Parliament House on Wednesday night. And an extra note that doesn't really make the list, this week Christopher Pyne boasted that he had been ‘cutting steel’ (probably to make himself sound a bit more blue collar). Below is the actual picture of what he did. So over the next week if you are chatting to a millionaire or the owner of a large multinational you should probably just concede the point that they've done ok in the Budget. For anyone else, they've lost out and will keep losing out until we have a Labor government again. Parliament doesn't sit next week. We come back the following week for a fortnight which will also involve Labor Senators pulling the Budget apart in Senate Estimates. PS. Barnaby had another rant and as he went on he was making less and less sense getting faster and louder and weirder. I stood up. He was told to sit down and the Speaker asked what my point of order was. I explained I didn't really have one but I thought he needed to take a breath. I was thrown out. Here's this week's song: “Take My Breath Away”, by Berlin.